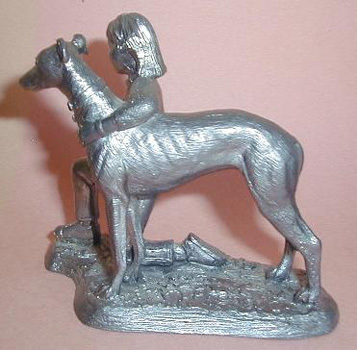 Here is a vintage solid pewter limited edition figurine of a gorgeous Greyhound and a girl. She has both arms around the dog she loves. This is a figurine all about love. On the bottom is the number 225. I believe that there was a limited edition run of 500. Measurements are: 5" W x 4.25" H.
The figurine is in excellent condition. It was made in the USA! Shipping for this item will be handled by Judy Longhouse. 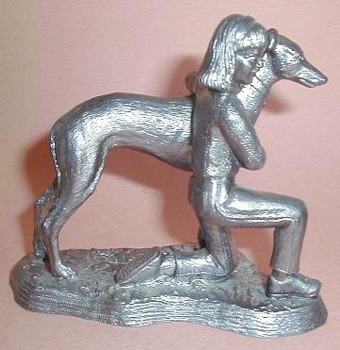 This item benefits the Halfway Home Greyhound Adoption. Sale of this item benefits Halfway Home Greyhound Adoption. Among other things this organization hauls Greyhounds from tracks to different Greyhound adoption groups all over the country. Literally thousands of Greyhounds have been helped by HHGA. Teddy Palmer, sole proprietor of the outrageous Tulsa Sighthound Hilton Hotel, spends much of her life on the road hauling Greyhounds. Here at IG Rescue...we love the inflated, giant size version of Iggies very much too. Heck..all of us love dogs....just about any dog and would do anything to help any canine in need. Although IG Rescue is much busier than we'd like to be...our problems are minimal compared to what Greyhound Rescue faces. Over the years Teddy Palmer has supported Italian Greyhound Rescue in just about any way she could. Now this is our chance to help the Big Iggies that she loves too!!! After all...this is The BIGGY Iggy Auction!! Please note: Buyer will send a check for winning bid made out to HHGA.